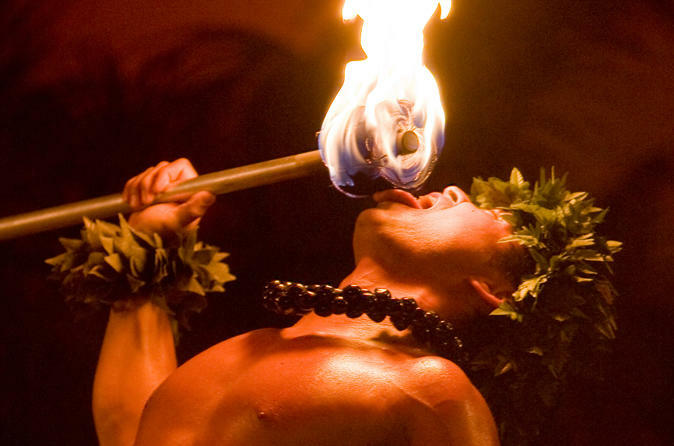 The only luau on Oahu's beautiful and scenic east-side - with an amazing award-winning production and show- starts with fire and finishes with a multiple fire knife dancer- spectacular, unlike anything else! Enjoy a short yet beautiful drive to iconic Sea Life Park. Breathtaking ocean views, interactive activities for guests and an amazing local-style all you can eat buffet. The perfect luau for the whole family as every ticket to Ka Moana Luau also includes admission to Sea Life Park Hawaii! Island greens w/ mandarin oranges, radish sprouts crisp rice noodles & Asian dressing. Following dinner guests enjoy an award- winning production highlighting the vibrant traditions of Hawaii and Polynesia! Our show navigates through Polynesia on a wayfinding adventure! Your experience culminates with the Polynesian Sword of Fire dance!! And don’t be surprised to find yourself as part of the experience! All luau tickets include admission to Sea Life Park, with up to seven days to redeem!